TV Size 42" to 70"
Will this bracket hold 65” tv at 90 degrees from the wall? If so is it sturdy? How wide is the wall plate? My studs are 24 inches apart so need a long wall plate. Thanks. Wall plate is 25 inches by 10 inches. Hope that helps. About 17 inches between centres. Hi, how far from the wall does the bracket sit when not extended? I.e. Does the TVs appear to sit a long way from the wall as the bracket looks quite bulky? Thanks. The product description mentions 15 degree tilt. Is this vertical tilt? If so, does anyone know how much horizontal tilt there is? i.e. How many degrees can it swing from being parallel with the wall mounting? Sorry to say the mount was fitted into an alcove at a house i'm no longer at. All I can say is that the bracket allowed the tv to be stored against the wall and then rotated out into the room for viewing from any where. I can't say anymore. Will this work with a 65" Sony unboxed weight is 24.1 kg? I am looking at buying this bracket, mounting onto external wall which is plaster, 1-2 inch cavity then breeze block/brick. Are the fixing screws long enough to penetrate deep enough into brick/breeze to hold this securely? My other bracket (which is no longer sold) came with screws roughly 4-5 inches long which is fine. Thanks for any help in advance. I have a LG 50 Inch 50PC1D Plasma TV, I wanted to use this bracket to put the TV up in the kitchen. 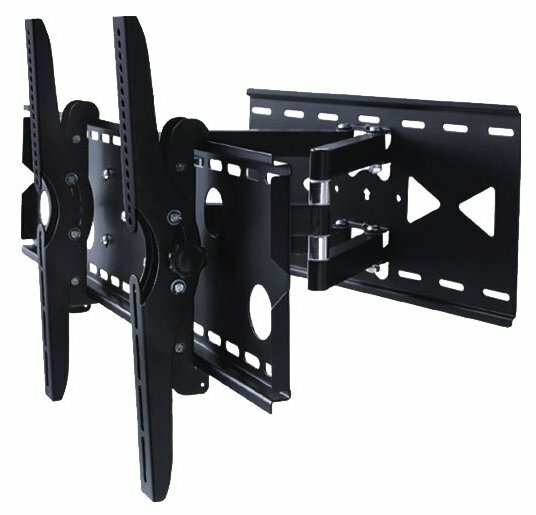 I wanted a swivel action bracket which enables me to move the tv to the kitchen area, will this bracket be able to take the weight of that TV? I know this is a heavy piece of kit, if this bracket will tick all the boxes, that's fantastic. Let me know please. The bracket is industrial and heavy duty and it wouldn't surprise me if it weighed more than your TV! Just ensure the bracket is attached to the wall properly and you'll have no worries whatsoever with the bracket itself being able to handle the weight of your TV. I've fitted a Vogel wall mount before which is about as good as it gets. It was extremly light but super strong and the action to move the TV about was so smooth it was unbelievable. The only problem is that these superior units start at £200 up to £2000, but they are worth it for the quality. This time around I was on a budget so opted for this unit. The action is a lot stiffer than the Vogel but it does the job and it' construction feels military grade. For the price you can't go wrong. This will take the weight if you are mounting it into a brick or breeze block solid wall, into a stud wall,even with lots of wood reinforcing will be a gamble. This thing is stiff and the angle through which you can move it is limited but sufficient for my needs. I don't think a thin TV will like being tugged at, regularly, with the power needed to move this bracket back and forth, considering its stiffness. The price is great and the mechanics for this bracket is heavy duty. I weigh 123 kg and have stood on the bracket twice while trying to install speaker cables in my son's play room so the manufacturing quality is great. I agree with other comments - this bracket is excellent, the weakest point will be your wall or wall fixings!